As the end of another school year approaches a new generation of young ladies and gents are sent through their unofficial right of passage known as prom. While this can be a joyous occasion for teenagers stepping into adulthood, it can also be a hefty strain on your pocket books. If you’re like most parents you can expect your daughters to want want to be the bell of the ball and it’s easy to wind up choosing a dress that simply costs more than you can your budget will allow. Formal dresses are currently ranging anywhere from $50 to $1,000. So how do you make sure your child gets the dress she deserves without breaking the bank? 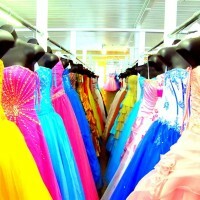 Try these 5 tips for saving your hard earned cash when shopping for prom dresses this season! Everyone loves to get dolled up from time to time. Sliding into a beautiful evening gown and spending that one magical night out can be exhilarating. But after the festivities are over, what do you do with the dress? 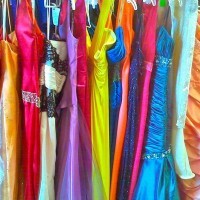 The vast majority of formalwear is only worn once. Most people ether sell it, donate it, pass it down to a family member or stick it in the back of a closet never to be seen again. Smart shoppers know this. Don’t be afraid to head into consignment shops for huge discounts! Stores like these can offer savings of up to 80% or more in some cases. You can even sell it back when your done with it! Clearance racks get a bum rap sometimes but if your willing to look there can be some gorgeous options for you hiding between the ruffles and lace. Instead of grabbing the seasons hottest item right away, start at the clearance racks and work your way out. You should also make sure to check for any potential damage to the dress. If you come across something that can be hidden or fixed, find an employee and ask for an even deeper discount for the damage. Sales associates are there to help and are very accommodating when trying to close a sale. Wether you buy your formalwear online or in-store, your dress is most likely going to need some type of alteration. If your going to spend money on customization either way, you mind as well check out the seasonal deals online before you end up purchasing. Shopping for all your favorite brands and styles is great but being able to compare prices and select the best option is even better. 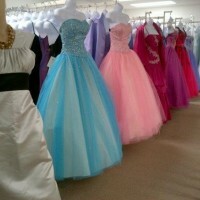 We recommend stores like eDressme and TD Dress for savings of over 80%. Pro Tip: Beware of size charts when shopping online. The safe bet is to go a size up for formals because many can run small. If your style absolutely demands the most fashionable brands you may want to look into renting a designer gown rather than buying it. The cost to rent a formal dress can range between $30 and $600 but can ultimately save you big bucks as opposed to buying high end designer brands. Pro Tip: Remember that the higher the price tag, the greater greater responsibility. If you don’t take care of your gown you can be charged hefty fines for the damage. It’s imperative that you make and stick to a budget if your planning on saving money on a prom dress this year. Your overall prom budget should factor in if your renting a limo or going to a fancy dinner? Don’t forget to include any shoes or accessories that you might need as well. After all the extras have been accounted for you will know how much you can afford to spend on the dress. Walking into a shop surrounded by thousands of choices can be overwhelming at times. Don’t let commission hungry sales reps sucker you into buying something that you can’t afford. Stick to the budget and remember that you always have options. At the end of the day it shouldn’t matter how much you spent on the dress. What truly matters is the memories that you make while wearing it. DealFly would like to wish you all a safe and memorable prom and good luck on the dress!